Someone once asked me how they could find the perfect axe and my reply to them was quite simple. The best axe is the one that fits your particular needs. Ideally, a person should buy one of these tools that have the correct carbon to steel ratio, has a nicely shaped blade and a handle that’s durable and easy-to-swing. While those aren’t the only considerations a person needs to make, it is a good start. To help out those people who are looking to buy one of these tools, I’ve compiled a list of what I consider to be the best axe models that can currently be bought. Sure, not every one of them will be good for everyone, but there should be at least one model that would fit each person’s needs. I’ve listed them from the number ten to the number one position for convenience. Designed by artisans who attempted to reproduce the typical American Dayton pattern, this tool is the perfect tool to be used for felling trees. It has a forged head that’s made from 5160 American steel and is expertly sharpened first in a robotic work cell and then by experience craftsmen using leather stropping and fine abrasives to put a fine edge on it. It has a 32-inch hickory handle that has a beautiful grain orientation and is the proper density for a tool this size. This handle is then mounted using a softwood wedge and a round wedge, just like it was done in years past. Manufactured in Sweden and consisting of a thin blade, this tool is designed to be used for cutting limb wood or for splitting smaller-sized sticks. 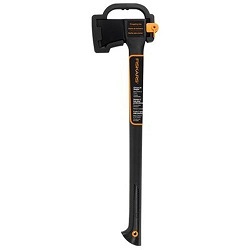 It has a lightweight design and weighs only 2-pounds and has a 19-inch handle that’s the practical size for swinging and breaking up smaller limbs. It comes with a sheath made out of vegetable tanned leather and is just the right size for putting into a backpack. This makes it an ideal camping ax that will give the camper plenty of power for cutting the wood for their fire. While this tool is a little bit different than the wood handled chopping tools that most people are used to using, it does have the power and the design to make short work of cutting up firewood and for chopping logs. It’s made in the U.S.A using nothing but American steel and manufactured in Rockford, Illinois using top-notch American steel for both the handle and the blade. Its blade is hand sharpened and its 26-inch handle is equipped with a genuine leather grip that makes this steel ax easier to handle and helps absorb the shock of each blow. While this tactical tomahawk isn’t really designed for chopping wood, it does have a number of utilitarian purposes that make it useful to have around. For instance, it can be used to remove branches from a person’s path, for breaching doors or for excavating dirt for campfires. 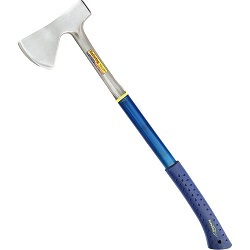 It’s made using a glass-reinforced nylon handle that’s equipped with a 2.75-inch stainless steel ax head. This tool has a length of approximately 15.75-inches and weighs only 24-ounces. Its design is based on the Vietnam era tomahawks and comes with a useful nylon sheath. Drop forged and tempered as one piece, this camper’s hatchet is the ideal tool for not only taking camping but for using in a wide variety of different circumstances. Since it’s all one piece, the user never has to worry about the blade flying off of the handle and is designed to hold up to frequent use. This tool is not only hand-polished but also hand sharpened and is made using the best American steel available. It also comes with a high-quality nylon sheath that’s designed to protect the blade and makes the hatchet a lot easier to transport. Made in Germany out of finely crafted C50 carbon steel and a Swiss-made handle made out of Grade A American hickory, this splitting ax is designed to quickly and effortlessly plow through firewood. It has a length of 36-inches and weighs around 6.7-pounds, which makes it the ideal size and weight for log splitting. It comes with a vegetable tanned American made cow leather sheath that keeps the head of this tool protected when it’s not in use. It’s a tool that’s made from the best components from all over the world. Designed in Finland, this tool can be used either to fell trees or as a chopping ax and has a number of features which should endear it to any amateur woodsman. It is 28-inches long and has an extremely sharp edge that’s achieved by the manufacturer using a proprietary blade grinding technique so this tool can make cleaner cuts. The head of this tool is hardened and forged steel that keeps its edge longer than some other wood cutting tools and the whole tool has a nice and balanced weight to it that makes it easy to hold and use. Entirely made using a one-piece forged steel design that’s crafted in the U.S.A., this tool is capable to handle a variety of tasks but its major one is its use as a splitting maul. It has a uniquely shaped head that allows it to split logs easily and it has an easy-to-hold grip that reduces the shock of each blow on the user’s hands and arms. This tool also comes with a nylon sheath that keeps the blade safe when it’s not in use and allows it to be easily transported. And since this tool is only 14-inches long, it’s compact enough to take just about anywhere. This tool has a unique design which allows it to drive wedges and stakes or to split wood. It has a blade that’s designed to penetrate into wood deeply and has a back portion that’s flat so a sledgehammer can be applied to it for extra force. It has a 36-inch handle that has an Iso-Core Shock Control System that absorbs a portion of each strike and prevents it from vibrating into the user’s arms. All of this makes this an ideal tool for heavy-duty wood splitting work and is designed to last a lifetime. This 36-inch splitting ax only weighs 5.85-pounds but it is the ideal tool for splitting both medium and large-sized logs. It’s designed so that each stroke delivers the maximum amount of force and it has a beveled blade that deeply penetrates wood when it comes into contact with it. This tool is also well balanced so that it delivers the right power to weight ratio with each swing. And since it’s made from quality components, it’s designed to last a lifetime. If power and performance are desired, then this tool offers the solution.